How to be happy every day in spite of the challenges you face daily? The author shows you how make happiness a habit by using the Joycentrix System described in this book.The Joycentrix System is a new philosophy that makes it easier to overcome sadness. It outlines a simple natural way to make Happy Living a habit. You don't have to struggle for years in the 'pursuit of happiness'! Instead you’ll learn a basic, easy-to-follow set of beliefs that make it easier to find happiness in your everyday life. 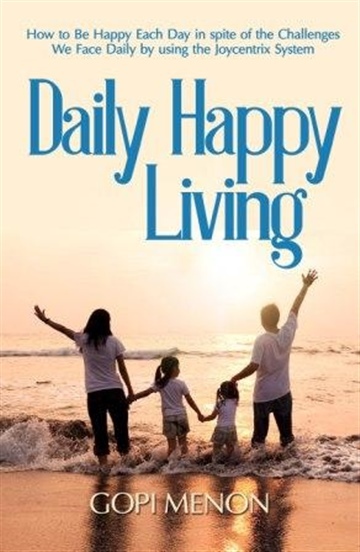 Grab a copy today and make Happy Living a Habit! "Truth is simple, so is happiness - is my summary of this amazing book. It was an effortless read yet mind expanding and thought provoking. It bravely addresses essential questions few would dare ask, yet humbly answers..." Ganesh K.
My name is Gopi Menon or just Gopi for short. I have been involved in electrical engineering most of my working life and am now retired. However, my passion has always been about the philosophy of happy living rather than engineering. Throughout my childhood, my teenage and adulthood, I have been absolutely confused and disappointed with the traditional methods for achieving happiness taught to us by ancient religious teachers and philosophers. So for decades I have been avidly searching for the truth about `happiness’ by reading books, by attending seminars and so on. However, it is only after much introspection that I finally stumbled upon a way to be happy every day of our lives. I learned that we can enjoy serenity and happiness in spite of the confusion, sorrows and miseries of daily life. This is what I share in my first book Daily Happy Living. I have always loved reading books of all types (including fiction and non-fiction) but my favorite genre is self-help, inspirational and motivational books. Some of my favorite old authors were William James, Emerson, Napoleon Hill, Og Mandino and so on, whereas my newer favorites are Tony Robbins, Mike Dooley, Don Miguel Ruiz etc. Regarding family, my wife and I just celebrated our fortieth anniversary. We are blessed with three wonderful sons and four lovely grandchildren who bring us endless joy. literate and conversational fashion that is never preachy or judgmental.